For this year’s short film screenings HorrorConUK wanted to try something a bit different and so we opened up for film submissions. We received many from all over the world – Australia, Israel, Austria, Sweden, Italy and Iran. We also received a wealth of films from the UK and it was great to see such diversity, not only of the genres but from the film makers themselves – people of different race, gender and social backgrounds. We wanted to offer a prize for the Best Short Film but wanted it to be unusual (like HorrorConUK!). Ben Wilkinson curator of HorrorConUK’s short film screenings contacted Sheffield College to see if one of the students would make something that we could present as a trophy – and we never could we have imagined in our wildest nightmares what we got back! 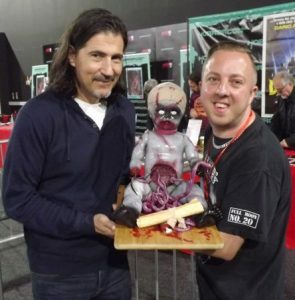 Here’s a picture of Ben with Billy Wirth holding the ghoulish award! 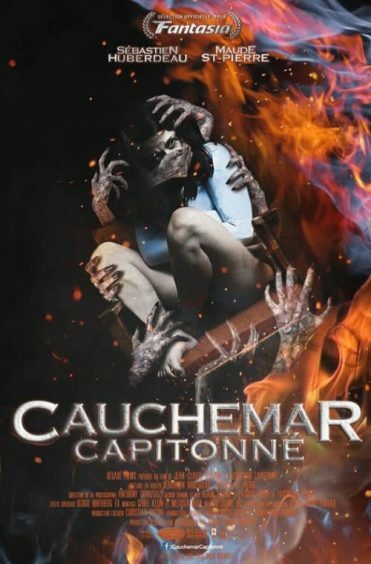 ‘Studded Nightmare‘ (Cauchemar Capitonné) A phenomenal piece of work from Canadian film maker Jean-Claude Le Blanc – It’s one part Evil Dead, one part J-Horror, but 100 percent awesome! We would like to thank everyone who attended and those who submitted films, the entries were all absolutely brilliant and we can’t thank you enough for participating at HorrorConUK 2018. You can view Studded Nightmare here – and we totally encourage you to check it out!